The days of building out pages with content just to target a certain term, building some links, and walking away are over. Gone are the days of waiting for traffic to arrive at your site. Instead of building a website, now you’re building a brand. A brand that delivers content through news outlets, a brand that is engaged in social media, a brand that pushes content through email and through other avenues just to name a few. As a small business owner, your job is more and more to be the ‘face’ of your business. Only, whereas before you might attend or give a speech at the local Rotary Club or Chamber of Commerce, now you’re doing it on Facebook or Google Plus. An analogy I’ve used before is one of a chef that opens his/her own restaurant. Now their job is not back in the kitchen but out front, greeting customers, interacting, showcasing the brand. Have QR codes linking to your Facebook and Twitter accounts at the reception desk. The main idea is to get customers involved. The chef could tweet when shopping at the farmers’ market and finding, let’s say, some great fresh fish or farm fresh veggies for the night’s special. He/she could post on Facebook some ideas for a new menu and get people involved in the decision, or do a poll on the website. People who are involved in the decisions are more likely to come in and try out the new menu items. Small business owners can’t just rely on Google anymore in their marketing strategy. SEO still remains a part of the overall plan, but it’s just one part that’s becoming less and less relevant. You are the one that’s becoming more relevant. 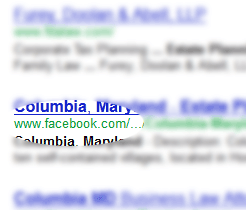 For one thing, Google and Bing are starting to personalize their results. You can say “Hey, we’re number 8 on Google”, but it may be number 34 for someone else. Or they could change their algorithm and move you down a few pages, killing your business. Facebook pages are starting to pop up in Google searches, and if the searcher is a member of Google Plus, the results will be slanted toward their ‘circle’ of friends comments. The search engines are starting to realize that ‘word of mouth’ carries more weight than a simple search engine results page. Only now the ‘word of mouth’ is on the Internet. It’s time for you to realize the same thing. Social media bring traffic through 2-way interaction, and you have to do your part of it.